Lombok is a popular tourist destination in the world. No wonder, if many foreign tourists who visit Lombok to just stop by the beach. Nmun, Lombok is not only famous for its temples and beaches. When you go to Lombok, you also have to taste traditional Lombok delicious meal. Are you interested? 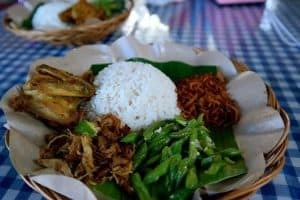 Here are some of recommendations for the best food in Lombok. Poteng jeje tujak is a typical Lebaran snack from the island of Lombok. Formerly this snack was only served on seven days after Idul fitri. Poteng jeje tujak in Indonesian means mashed tajok tape. This snack consists of two main compositions, namely poteng or tapai made from sticky rice, and jeje tujak or in Javanese better known as tetel. According to the beliefs of Lombok ancient people this rare snack maker must be a holy person (free from big obstacles or menstruation) and in circumstances of ablution. Grilled fish seasoning in Lombok does not have the same significant difference in spices in general, may be more spicy and traditional traits more tasty. However, Nipah Beach has already famous as the best spot to enjoy the grilled fish with family or friends. And no doubt, the quality of the flavor of grilled Nipah fish can also be relied upon. You can only find this food in Nipah, Lombok. While enjoying this menu, you can see the beautiful scenery of Lombok Beach. 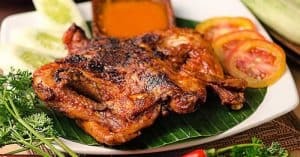 As a traditional food of Lombok, Taliwang Chicken has a long history. This cuisine was first introduced by the chef of Sultan Sumbawa who was placed in Lombok during the time of King Karangasem. Taliwang Chicken cuisine can indeed be found in some major cities in Indonesia, as well as Padang cuisine. You can use this menu as breakfast. But did you know that to make a good chicken taliwang contained from the deliciousness of marinade. That’s why the Taliwang Chicken you tasted in Lombok always tastes better in other areas. This food is usually served with Pelecing kale as a vegetable. Terong in English means eggplants. Eggplant is much underestimated as a vegetable that is unable to provide delicious flavor. But in Lombok, eggplant can be excellent. 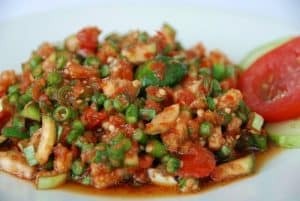 Beberuk is a typical lalapan Lombok, West Nusa Tenggara which the basic ingredients are sliced eggplant and long bean sprinkled tomato sauce. Sometimes it isalso added sliced raw onion & lime mixture as a flavor enhancer & aroma. The other name is Lasuq. This food is usually served along with Pelecing Kangkung & Ayam Taliwang. Typical taste, will feel more stable when eating it by hand. This traditional Lombok food is usually served with Chicken Taliwang for breakfast. Kangkung means water spinach. The water spinach used for cooking Pelecing is also very distinctive. 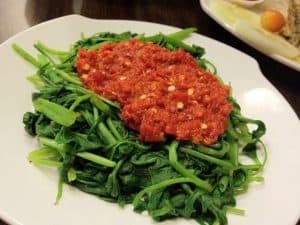 Unlike the commonly grown kangkung plants in Java, Lombok’s water spinach is a watercress that is usually grown in a river that flows with certain methods to produce kale with a large and crunchy stem. Usually it is served with chili paste, bean sprouts, peanuts & serudeng. Kangkung in this area is very famous. The texture is soft so it does not feel tough even though we eat up to the trunk. No wonder if Lombok kangkung an alternative souvenirs typical of West Nusa Tenggara, especially Lombok. 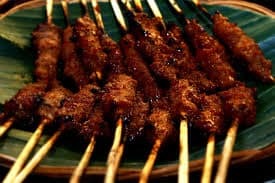 This satay can also be served for breakfast menu in Lombok. The making and discovery of the Ratu Sate has started since ancient times. It is a family of King Pejanggik who lives in Rembiga and is very skilled at making satay. Hereditary skills are taught to the next generation until now. Sate Rembiga comes from beef that has been processed with a mixture of secret spices and other sate mixing techniques. Now the skill of Sate Rembiga is not only a matter of hereditary skills, but it has become an effort to raise the economy of Rembiga and Mataram residents. 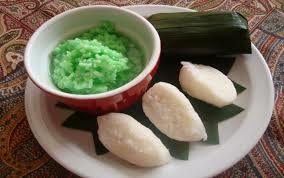 In Java, perhaps this food is similar to “nasi uduk”. This food comes from a small village called Puyung, Central Lombok District. The name of the inventor and peraciknya is Inaq Esun (Inaq in Lombok means mother). In appearance, the Nasi Puyung menu is not too special. Only contains suwiran (pieces) of chicken meat with chilli, soybeans, dried shrimp, abon & fried eels. 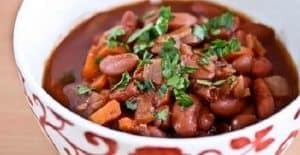 The strength of this food lies in its simple spicy flavor. This breakfast menu of Lombok called Bebalung, in Sasak means “power”. 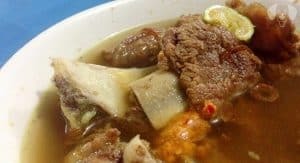 Bebalung made from beef ribs or buffalo ribs are mixed with concoction of spices composed of chili, garlic, onion, galangal, and turmeric plus ginger to taste spicy cabenya own distinctive. This is a typical Lombok food that must be tried for travelers who visit the island of Lombok. Sauce is very different, in because there are special seasoning style Bebalung that can not be found in other typical foods. Breakfast with satay menu is delicious. Bulayak is a kind of lontong or tupat which is wrapped with palm leaves or enau leaves with elongated shape like a spiral, so to open it must be in a circular motion. 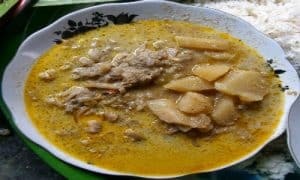 In Sasak language “Bulayak” does mean “Lontong” For some people, the taste of Bulayak is much softer and tasty than lontong or ketupat. This food is usually served with Sate. 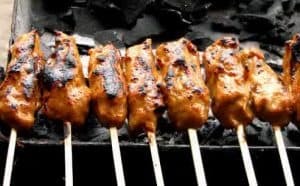 The place where Sate Bulayak was introduced is in Narmada area, which is a place in West Lombok regency or about 15 20 minutes from Mataram City. The next satay breakfast menu is Sate Tanjung. It is a unique culinary Lombok unique. If we usually eat satay from beef, chicken or goat but the typical satay of Tanjung Village, North Lombok, West Nusa Tenggara is using fish. How is the taste? It is savory and spicy. Initially, this satay is a food that is served at a religious ceremony or a wedding celebration. 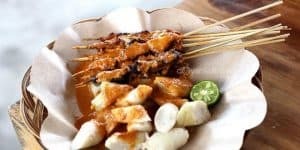 But along with the popular delicacy of Sate Tanjung, this food becomes a culinary dish that we can enjoy every day or for breakfast. 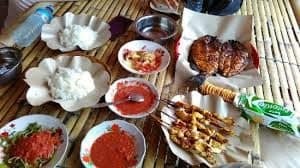 Not only that, the local government has even set Sate Tanjung as a typical food of North Lombok and become part of the tourist wealth. While, kelor kelaq using kelor leaf that is processed so vegetable nodes. For kelaq lebui refers to vegetables containing beans called lebui which are similar to black soybean seeds. Then kelaq pedis banas means spicy acid vegetable which uses basil as its base material. Last is the most famous spicy kelaq sebie. Kelaq sebie in Sasak means spicy tongue that uses vegetables in the form of eggplant and long bean combined with tuna fish. Lombok-shaped vegetable food that can match the delicacy of other non-vegetable-based food other is vegetable ares. What is ares? Ares is a food consists of vegetables from Lombok that uses a base ingredient called Ares. Ares refers to the banana stem that is still young. Ares that have been selected then processed with a sauce made from coconut milk. Ares has a savory taste of the results of the use of coconut milk combined with spices like curry spices like coriander, onion, garlic, ginger, pecan, turmeric, galangal, and cumin. To enrich the dish, Lombok people usually add meat into it. Those are the best foods of Lombok. You need to taste them while visiting Lombok. Or, you might bring them to home for your family.